Designed using the very latest in airflow & heating technology, our commercial electric space heater range includes high air volume units suitable for ducting through numerous outlets or long distances. All of our range of commercial electric heaters are built to withstand the rigours of industrial use , using the high specification of materials and production methods. Our expansive range has something to suit every application and is an ideal safe,clean and fume free alternative to diesel and gas. 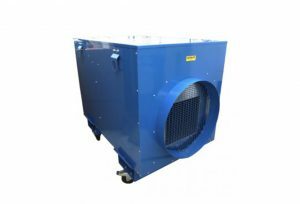 With the ability to duct to 15 metres from a single unit, our FHE Series of commercial electric space heaters now offers integrated vents made from the same high quality and high gauge steel as the rest of the unit and assembled as an intrinsic part of the chassis rather than a separate item. Using a electric blow heater remains one of the most cost effective solution for providing emergency or supplementary heat for a particular space in your commercial heating application or office. The calculation above is based on 0.14p per kWh – please check with your current electricity bill for the exact hourly rate you are currently paying. Post ventilation – This feature (setting time between 1-9 minutes) enables the electric fan heater to cool down before eventually switching off. This saves and utilizes the energy to it’s maximum, as the residual heat is fully utilized, and blown into the area that is being heated. 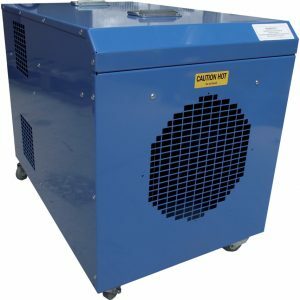 Digital Temperature Control – These commercial electric fan heaters can automatically control the room temperature up to a maximum of 35 Degrees C and are an ideal solution for someone looking for a frost protection heater, or whereby you have a requirement to keep a area heated to a specific temperature point . The heater will automatically come on , if the room temperature falls under the desired temperature you select ( up to and including 35 Degrees C) , the heater automatically switches off when that temperature is achieved. A very powerful 32 Amp electric fan heater that offers 29kW of sensible heat. Designed and built to withstand the rigours of regular site use comes complete with features including an adjustable thermostat, over temperature protection and lockable castors while the optional single and multiple outlets allow the FHE29 to deliver warm air either along up to 10 Mtrs (maximum) of ducting via one 250 mm diameter spigot or to up to 4 separate areas, via the 4 x 150 mm diameter spigot option . A clean, odourless and fume free alternative to gas and diesel heaters. 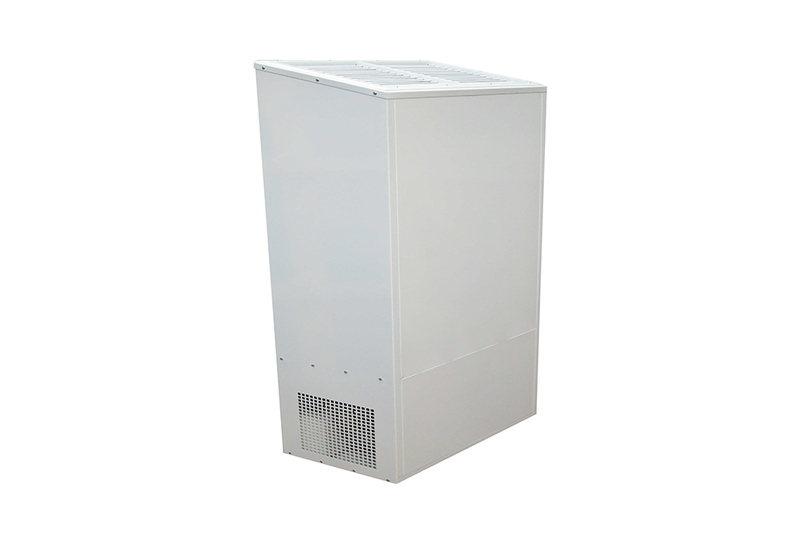 There are two heaters within this commercial space heaters electric range , the first has a maximum output of 18kW , this commercial electric heater is designated the FHEHT18 , or we have the FHEHT30 model, which will do maximum heat output of 30kW of output.Both of these require a 3 phase electrical supply , and should only be used in door or protected from the elements. 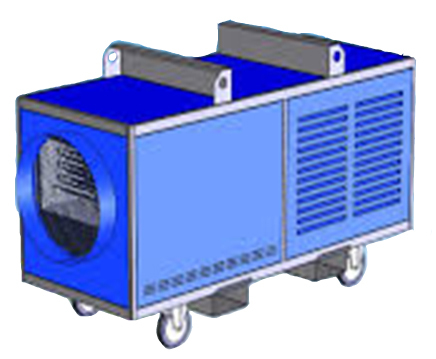 These commercial electric fan heaters can operate in heating mode (either full or half power) and in ventilation mode (with heat elements turned off) and can utilize a flexible warm air duct , of up to 15 metres in length as well as a remote thermostat and controller if so required by site conditions. or can be used in just a free blowing configuration. 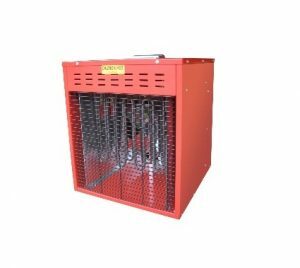 Or for using these Electric Commercial Heaters in conjunction with warm air hoses or ducts , we have the following accessories available – Warm Air Hose Splitter or “Y piece” and also Warm Air Diffusers for distributing the warm air into the desired area. and particularly suited to marquee heating applications. Both of these commercial electric fan heaters comply with the following standards: EN 60335-1, EN 60335-2-30, EN 62233, EN 55014-1, EN 55014-2 and meet the requirements of European directives 2006/95 / EC, 2004/108 / EC, 2011/65/EC. The most powerful 63 Amp heater available, which can be ducted up to 30 Metres . Designed and built for industrial use the FHE42 features variable heat output, 24 Volt control circuit for safety, remote thermostat socket, spigot, over temperature protection and an auto run on as standard. 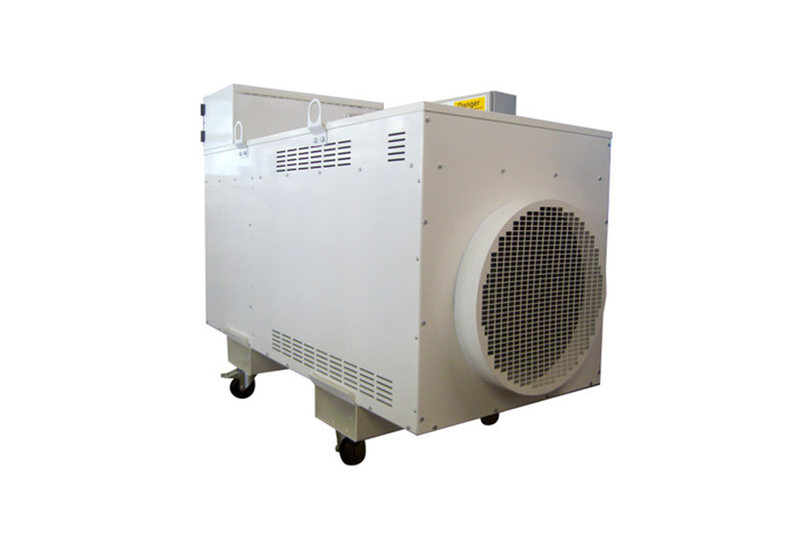 This Electric Commercial Heater , with it’s output of 63 kW has been designed for heavy duty applications. Ideal for use in shipping, surface coating or large scale heating applications; the FHE63 features a powerful contra rotating fan motor for pumping heat down long lengths of ducting, a heavy duty build, thermostatic control, over temperature protection and lockable castors. An incredibly powerful commercial fan heater originally designed for use in larger industrial and commercial electric heating applications. The FHE110 delivers 9,000 m³/hr of heated air and features heavy duty materials, multi-stage switching for variable output, adjustable thermostat, over temperature protection and auto run on as standard.